If you know me, you know that one of my key frustrations regarding women in history is not only the abusive, chauvinistic treatment of them, but the insanely submissive way that they take, or are portrayed to take, the lack-of-rights, the cheating, the life lived within the constraints dictated by the patriarchs of their family; as if it might be excusable— maybe even expected. The infamous Anne Boleyn and similarly strong-willed women seem to fairly willingly do the bidding or turn a blind eye for their male family members and husbands. Many of them end up paying a huge price either for the way they carried out their orders, or the way in which they subverted them. 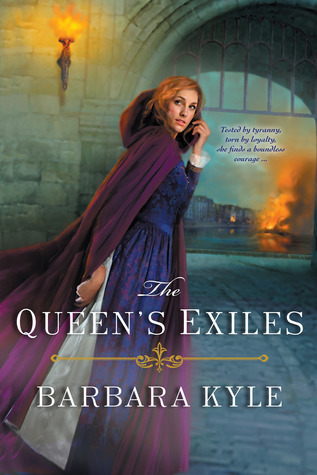 In Barbara Kyle’s The Queen’s Exiles, my exasperations are finally vanquished as we meet the independent, confident, ahead-of-her-time 16th century feminist of sorts, Fenella Doorn. I have no idea if this is even plausible in the 1560’s, but I love it nonetheless. Fenella has successfully built a profitable business for herself on an island in the South of England with the help of her elderly father-in-law. When a long lost acquaintance, Lord Adam Thornleigh, sails back into her life, her world is turned upside down. Adam and Fenella embark together on their own individual yet concurrent missions in the Spanish occupied Netherlands, only to realize that the tasks that they have set out for themselves will embroil each of them into a complex series of intertwining events. Through it all, Fenella exuded strength, even when all she had left was her character. Her will and determination kept the pages turning as I cheered her on throughout the story. The Queen’s Exiles had me engaged from the very first page, and I found the writing style to be very pleasing to my contemporary literary sensibilities. By that I mean, in part: the pace was swift, the amount of description wasn’t over the top, and the dialogue was bold and concise. The afterword gives a much appreciated breakdown of the historical facts used to build the story, as well as clearly outlines the fictional elements conceived within the author’s imagination. I deem this feature to be a great bit of added value, as I so often find myself wondering after a novel of historical fiction— what exactly is fact, and what is simply a best guess, or perhaps even complete fantasy. I believe any historical fiction enthusiast, or anyone looking for a good starter for the genre, will be immensely entertained by this bygone tale of love and life. This is the sixth book in Barbara Kyle’s Thornleigh Saga, though it is the first I have had the opportunity to enjoy. In future, I plan to delve into the series, beginning with book number one: The Queen’s Lady. This book is scheduled for release on May 27th, 2014. This entry was posted in Muse Reviews and tagged Book Review, Book series, England, historical, Netherlands, reading, Sark, Strong woman. Bookmark the permalink. Thank you very much! I hope to hear from you in the future.